Veteran actors Ronaldo Valdez, Leo Martinez, and Pen Medina vie for the ultimate title to be the first Filipino colonel. Tired of the usual hugot ads clogging your Facebook ad? Or you just want something as feel-good and funny as that viral Manulife ad? This new clip from KFC joins the funny bandwagon with some recognizable star power, too. 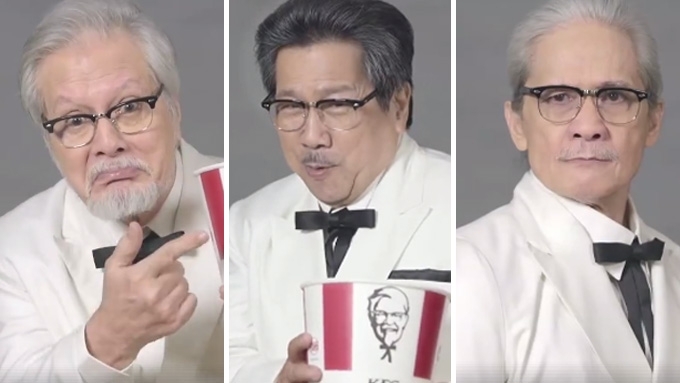 In the clip, KFC is in search of their first Filipino Colonel and auditions three veteran actors for the job: Ronaldo Valdez, Leo Martinez, and Pen Medina. Each audition highlights each actor's trademark style, from Valdez's kindly and fatherly demeanor to Martinez's Batangeño humor, and Medina's tough and intimidating presence. The ad reveals that a final decision will be announced on May 29.